“Divine Bodies: Sacred Imagery in Asian Art” is a carefully considered, beautifully displayed presentation of works both traditional and contemporary dealing with religion and spirituality. By focusing on four major categories — Transience and Transcendence; Embodying the Sacred; Aspects of Divinity; and Divine Metamorphosis — curators Qamar Adamjee, Jeffrey Durham and Karin G. Oen have created a harmonious framework for presenting work originating from various countries and different religions. The viewer is guided by an informative booklet through what would otherwise have been a bewildering pantheon of Buddhist and Hindu sages and gods with their manifold aspects and attributes. A wealth of information is available to the curious, while the distraction of word-heavy walls is obviated. There are a few apposite quotations from the Bible, William Blake, Black Elk, Kahlil Gibran and others, with introductory text for each theme. The first theme, Transience and Transcendence, examines the mysteries of birth and death, earthly mortality and spiritual immortality. Introducing the theme is a wooden “Crucified Christ” from the Philippines, carved and painted between 1650 and 1750, a sensitive portrayal, both elegant and stark, of the Redeemer, eyes closed in death. Separated by a wall lies his Eastern analogue, a contemporaneous bronze “Reclining Buddha” from Thailand, depicting the moment of Shakyamuni’s death, or attainment of parinirvana, with (I quote from the curatorial booklet) “the Buddha’s impermanent physical components — atom-like elements called dharmas — dissolved back into the natural world.” The Buddha’s teachings are also called Dharma, so the idea here is that his vanished physical being is transubstantiated into enduring moral exempla. Think of a nice twist on the Christian concept of communion. However, as an eighteenth-century Tibetan painting and two reliquaries (in the form of miniature stupas, from Pakistan and China, separated by 1600 years) attest, the remains of the teacher, now divine, would be preserved and venerated. Gauri Gill, a contemporary Indian photographer, explores our impermanence (anityatva, in Sanskrit) in high-contrast black and white photos of traditional-culture birth and burial in the untitled, numbered works of her “Birth and Traces” series. 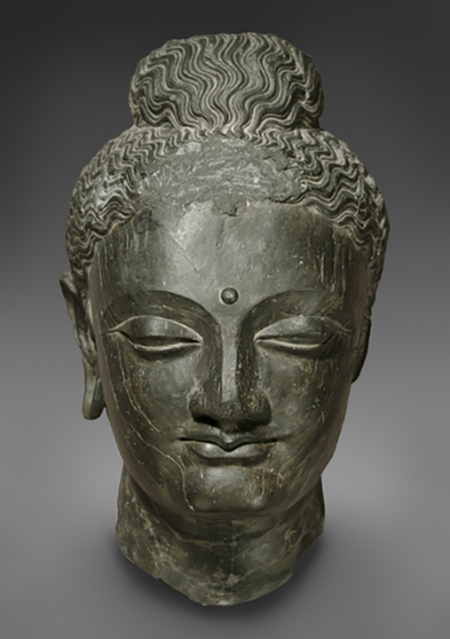 The theme of Embodying the Sacred is handled by showing how Asian artists infused the ”infinite divine” into seven portrait heads of the Buddha, whose features were unknown and thus could be imagined according to local customs and culture, producing regional stylistic variations. At the same time, the figures possess iconographic commonalities that transcend cultural and political borders. An enigmatic, gentle smile denotes compassion. Downcast, inward-looking eyes, and an urna circle between the eyebrows, denote spiritual vision. Elongated earlobes serve as reminders of the former prince’s heavy earrings. A topknot of hair, or ushnisha, signifies understanding and wisdom. The third theme, Aspects of Divinity, is subdivided into four sub-sections. The Beautiful is represented by Hindu statues of the elegant Shiva and his beautiful consort, Parvati. The Sensuous is represented by an enticing nature goddess figure leaning against a tree trunk, symbolizing female fecundity; by the Vajrayana Buddhist deity Guhyasamaja (Hidden Union); and by a conjoined couple symbolizing the reconciliation of polarities. The Fierce is represented by a Japanese wood sculpture of the Buddhist deity Ragaraja, or Aizen, whose fanged mouth and furrowed brow are complemented by a glaring third eye, for spiritual penetration of the world of illusion; and by stone sculptures of the Hindu deities Chamunda and Shiva, with fangs and staring eyes, and bearing various parts of corpses. The Gentle is embodied in the Chinese porcelain of Budai Heshang, “the friendly one,” a plump, jolly Maitreya, or Buddha of the future. “Divine Metamorphosis” is represented by two Indian statues. A granite statue of Shiva is revealed in the linga, a merger of traditional Hindu male and female symbols. A sandstone statue of the deities Shiva and Parvati combined into the hermaphroditic figure of Ardhanarishvara, “he lord who is half female.” Dayanita Singh’s work over nearly thirty years worth of books of letters, photographs and a video, documents the life of Mona Ahmed (1935-2017), a hijira, a woman born into a man’s body, bringing the imaginings of traditional mythology to reality.